There are many ways to achieve immortality. And one is working with stone. Stone has a permanency. Look at Stonehenge. There’s no moving that set of entrenched monoliths, thank you. They’re here to stay, and have been for the last four thousand years and some. Their makers are anonymous, yet their work fascinates and entices us because we have not the foggiest idea what they meant by it. Stone has a permanence. And as the millennia have worn on, the material has not lost its momentousness. The men who worked it, in mediaeval times, were a special breed. Unlike blacksmiths and bakers, they could not live their lives in one place. They wandered from project to project, carrying out stonework where it was needed, when it was needed. A mason – according to a rather wonderful local history book I stumbled upon by FW Brooks – would arrive at a cathedral or an abbey asking for work, and their first port of call would be the mason’s lodge. He might have tools; he might not, if times had been hard and he had been forced to sell them. He would prove his identity by knocking in a prescribed way, and answering a ritual set of questions. And if he was lucky, the Master-Mason might set him on plain ‘walling’ with a few simple mouldings, to test his mettle. Each piece he cut, he would put his own mark on the stone. And the Master Mason could check it, and if it was good the mason might gain advancement to more complicated work. Mason’s marks have been found all over Britain: in all the key mediaeval bastions of stone. They are little geometric doodles generally, or a variation on a ‘W’. An identity, which would have been very important to an itinerant craftsman. The oldest part of the Bodleian Library, Oxford, is the Divinity School – you know, the room used as the infirmary in the Harry Potter films. If you are wise, as well as looking around, you will look upwards: for there lies some of the most stunning stonework you will ever see. The impudence of a mason who simply cannot resist bringing this figure in among all the lavish tracery and pageantry of benefactor’s coats of arms! This gesture reminds me so much of the monks who painted bawdy images in the margins of lavishly illustrated commissions for noblemen. Who is this man, dressed humbly, encroaching on all this splendour? There is no-one to tell his story. Except for perhaps another mason, in the town of Cirencester . If you visit the church of St John Baptist, which towers benignly in golden stone over the little town centre, pause as you leave the Chapel of St John The Baptist for the door into the South Porch. For you are flanked by masons. 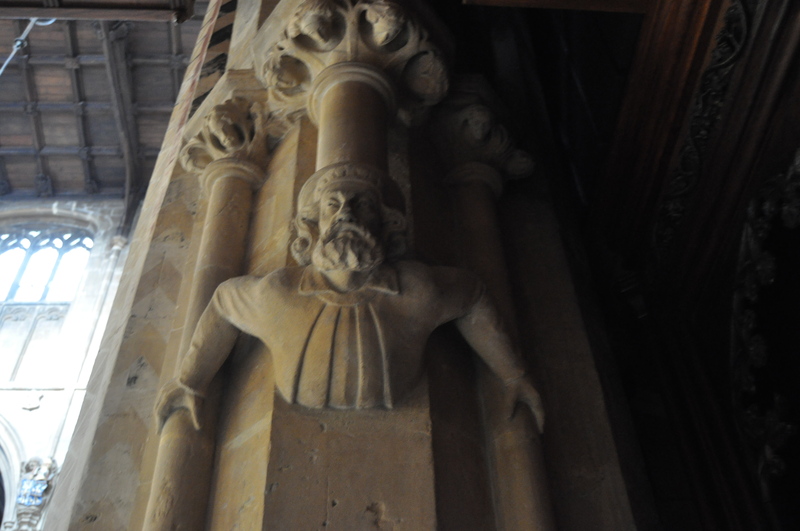 On your left is an extraordinary mason’s trace: a lifesize figure – it looks mediaeval – coming straight out of the pillar at you. Most unnerving. Yet: not as unnerving as the figure on your right side. For we know him. He left his mark, and a date.He was the Master-Mason of his time. And, to mirror the mason from centuries before, he cut himself into the stone. A striking figure he looks, with eyes like a hawk’s, cunning and keen. Had I been a mason under his stewardship I should have done exactly, precisely what I was told. 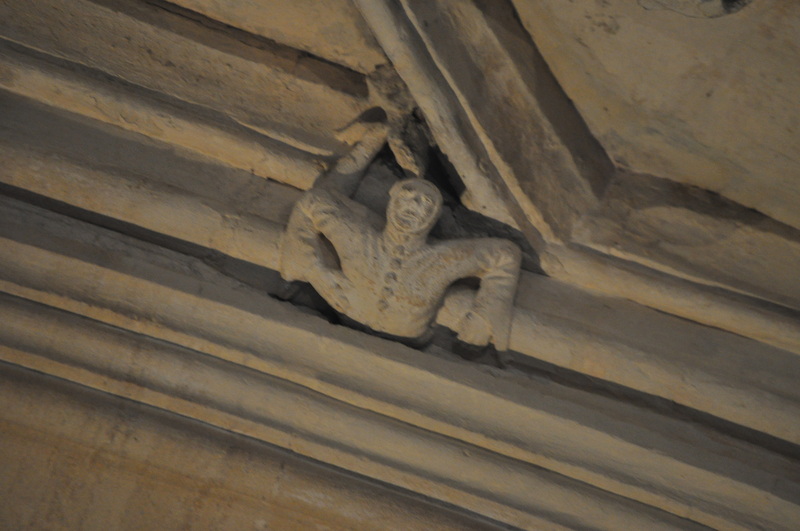 He has answered my question: for I’d wager the little figure at the Bodleian was a mason too. How many masons are there, across these islands, emerging eternally from the stone they crafted? Posted in Quirks of HistoryTagged england, masonry, masons, mediaeval history, stonemasonsBookmark the permalink. I loved this blog! I remember reading the novel Sarum many years ago and enjoying it. Thank you! Hi Pauline! It’s a fascinating area. So long ago, yet still so present in our buildings and landscape. Thanks, Nancy! I didn’t realise Nancy Curtman was writing over here! And I have never been to Sarum.Was it Edward Rutherford who wrote about it, a great epic spanning thousands of years? I must go and take a look very soon. Nancy lives in San Francisco . . . but she is an avid traveler. Well, it’s a beautiful report. Inspiring. I have seen some very interesting carvings in church buildings around the world. 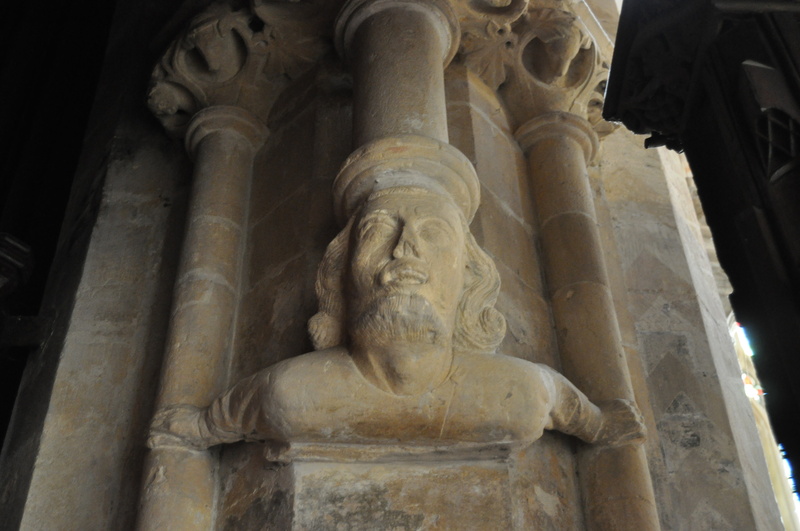 I think that the stonemasons always tried to be a little sneaky :-). I would expect initials of some kind. The little guy crawling out of the trim was a fun surprise. The masons emerging from their work have been a revelation, I have to say, PT. To walk between the two of them: that was an experience. It’s good to follow up these leads, Roger: the stuff of life. I had not noticed that they both hold a letter pose. How intriguing; I’d love to know more. Thanks for writing this! Ken Follett’s Pillars of the Earth has a lot of information in the story about the medieval mason’s work. I was struck by the techniques for setting out – and the approach to working at height! It’s also interesting to see how the practical problems of the day – access to materials, feeding the staff, wondering how to make it as tall as possible without collapsing – are so different to modern construction. They also used very versatile materials that were capable of being accurately hand shaped with simple tools. 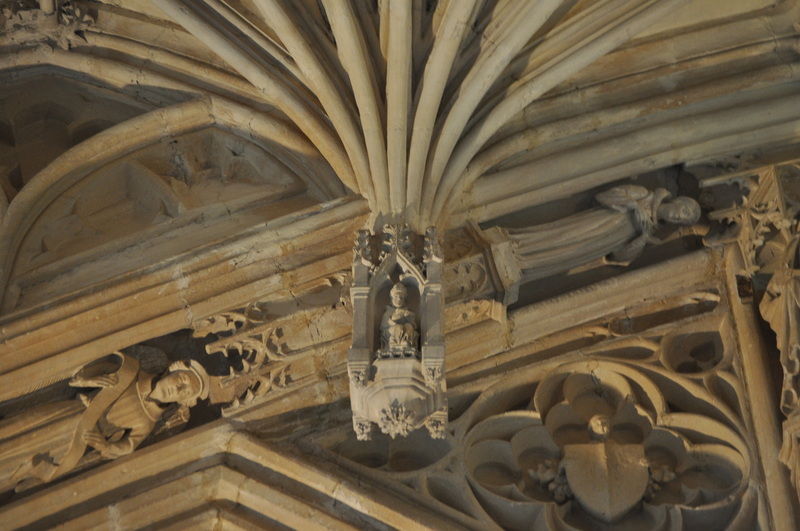 Modern building is very much about achieving a quick turnaround, 600 years ago you could spend a few extra days making a fancy feature, not any more sadly. I also like the way the individual craftsmen could leave their own mark, sometimes a little bit hidden. If you get the chance to look under the choir seats in Norfolk cathedral, you can see a lot of narrative carvings, little theatrical scenes. Oooh, thanks for the comment and that tip! I shall check out Norfolk Cathedral the first chance I get. The Ends Of The Earth has stayed with me ever since I read it. Such a striking book, so beautifully researched. The importance of a walled city was really brought home to me through its pages. Sounds like I need to read that one too! I love historic construction, they did so much without electricity or even steam power. Apologies, meant Pillars of the Earth! Ken Follett is a favourite of mine. Your pictures are delightful and your snippets of history keep me coming back again and again. So, thanks, and stuff. I loved this post Kate – even more, my mother would have been enthralled and telling me to dive right into her In the Footsteps of a Stonemason to see what else we could dig up to add to the conversation – It’s downstairs somewhere, I’ll see if I can find it! Ooooh, I shall look forward to any extra snippets, Wanderlust! So, cyber hacking took its earliest form as stone masons. It was a kind of subversion, set there in stone, Lou. I was aware of this Kate but not the sheer audacity involved! Did you clock Roger’s comment, Jim? He noticed the figures are all in the shape of an ‘M’….it’s possible these are indications of just how much Masons percieved themselves as part of the establishment. Not a lot has changed then! Now, people know the Masonic signals who have never lifted hammer or chisel! It is actually sad that in most cases the names of the creators of these marvels are lost, while the people who merely commissioned the work are the ones known. That is so cleverly done with the jutting-out one holding the pillar on his shoulders. Must get a bit tiring after a century or two, though. Weary, Col, as you say…. Loved the pictures, and the lovely sentiments. And of course the craftsmanship and the wit of the originals! I would only query the W (or is it WI?) with its date of 1652, if the suggestion is that it is a mason’s mark. This looks to me more like a tourist’s graffito by a Walter Jonson or some such, done during the Commonwealth when it might have been more acceptable to deface churches. Masons’ marks were usually much more cabalistic-looking, hieroglyphic almost, much like John Dee’s famous monas hieroglyphica. And I would be interested to know if masons’ marks survived into the 17th century and if we have inventories for them. Of course, you may not be implying any of the above, in which case I unreservedly withdraw my comments! It’s possible, Chris: though it was the church guide who passed on the information that the two were connected. As for 17th century marks: Warwick University’s Dr Jenny Alexander has dug up a reference to them by Nicholas Stone, the 17th-century London mason and sculptor wrote in his account book for 1646 ‘I went to Mr Wilson’s yard and marked 80 [….] of stone wch he sent the next day’. Henry Wilson’s stone yard was in Petticoat Lane and supplied Portland stone to St Martin’s churchyard. Dr Alexander asserts the mark widely believed to be that used by Sir Christopher Wren to select Portland stone can be seen on a block displayed in the crypt of St Paul’s cathedral in London. I’d have to do a lot more research to find out more about the mason, whose identity is, I believe, known. An excuse to return. Excellent. That sounds intriguing! And if they continued into the 17th century, I wonder if modern masons at ecclesiastical sites (say, Wells or Canterbury) do the same now. Another angle on a fascinating subect! Coincidentally, just seen a link to this: http://www.medievalists.net/2013/02/04/norwich-cathedral-yields-its-medieval-secrets/ about medieval graffiti in Norwich Cathedral. That is absolutely fascinating, Chris! Just makes you want to jump in the car and drive up there with the camera!! Thank you. I’ve just connected the Masonic Lodges with the Masons, Kate… don’t ask me why I didn’t realise they were linked together before. Sometimes I do overlook the glaringly obvious! I’ve probably noticed quite a few of these figures over the years as well, but not noticed them at the same time! I do need to be more aware. Another great post that has taught me something, Kate. Thank you! You are welcome, Tom – to be honest I had not given the little figure at the Bodleian a second thought until I saw this pair at Cirencester. Sometimes it takes a few times before you make the links. I will definitely be more aware when looking at old buildings in the future.. Fascinating!! Ooooh, a Milan Fort! When are you off there, Tandy? Cannot wait to hear more! Cool post, Kate! My day job is in tile and stone. It’s an easy field if you’re a tactile type. I am. I oversee the making of all of my company’s showroom display boards that my sidekick, who is an excellent craftsman, builds. I’m thinking about having him read this post — give him the idea to leave an almost hidden signature of his own someplace — if he has not been doing this all long. He’s built thousands over the past three years. I should be very interested to see of he has left a signature quietly, Lame. Were I an artist craftsman, I would make a point of it. Isn’t this fun? Along with Pillars of the Earth, I’m remembering Larkrise to Candleford. Is it Tom that is the stonemason? In one episode, his tools are stolen and his plight in life with a family becomes quite dire. There I go, off in fantasy land, while you peer upward at the real deal, Kate. Loved this post. I must re-read that, Penny. it is an age since I put it down. And you’re right: a mason’s tools must ahve been very important to him. And I suppose time has taken all of these characters off to fantasy land. It’s just nice to see the traces they left behind, there on the wall. I love those quirky additions to the mason’s work. I’m glad at least some of the masons were able to leave their mark. Artists deserve to be remembered. I carve in wood but have not tried stone. What I find truly remarkable is how the Egyptians cut stone for pyramid blocks and did their artful stone carvings and sculptures. They were of the Copper Age so probably did not have iron to make steel and mere copper is too soft for stone carving.